Floodwaters in Duluth, MN, broke open the Lake Superior Zoo last night, killing a number of animals. A seal managed to escape and was found on one of the area's many washed-out, sinkhole-ridden roads. 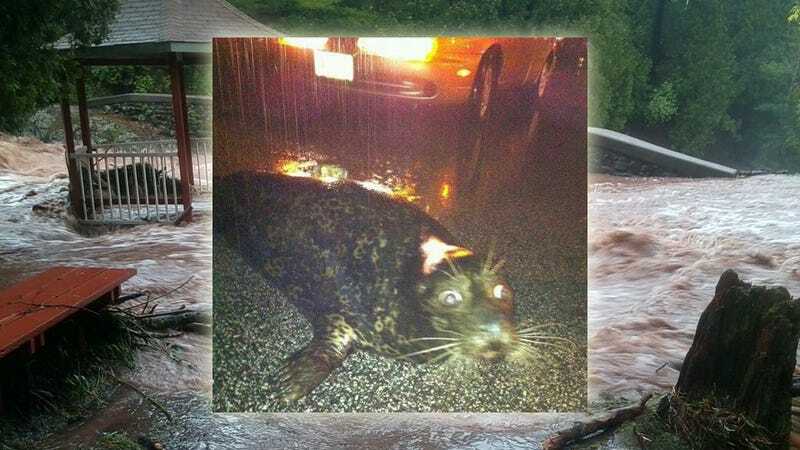 The seal was found by local resident Donald Melton, who went to check on a nearby road closure. In an interview with KARE 11 news, Melton described the encounter with the "pretty relaxed" animal. I was a little dumbfounded. At first I had to think, "Do we have seals? We don't have seals. "…I just wanted to get out and pet him, but I didn't want to mess with a wild animal either. I don't know what the trainers do at the zoo, but I just wanted to keep him safe. In the context of the many ruined roads, cars, and buildings, it is nice to see that one seal made it out alright.